Carlini is the first-ever volleyball player to take home the award. She topped Olympic gold medalists Kyle Snyder (wrestling), Laurie Hernandez (gymnastics), Aly Raisman (gymnastics), Ashleigh Johnson (water polo), Kayla Harrison (judo) and Ginny Thrasher (Olympic shooting) for the honor. A member of the bronze medal-winning U.S. National Team at the 2016 Pan American Cup, Carlini is the first four-time All-Big Ten pick in program history. She ranks first at Wisconsin with 74 career double-doubles and second in career assists with 5,599. The AAU Sullivan Award has been presented annually since 1930 to the most outstanding amateur athlete in the United States. 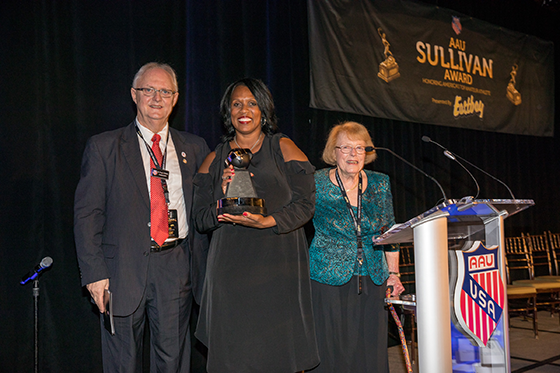 Representatives from the AAU created the Sullivan Award with the intent to recognize amateur contributions and achievements from non-professional athletes across the country. World renowned golfer Robert “Bobby” Jones received the inaugural award in 1930 and swimmer Anne Curtis became the first female to accept the award in 1944. Other notable athletes to win the award include famed Olympians Mark Spitz (1971), Carl Lewis (1981), Jackie Joyner-Kersee (1986) and Michael Phelps (2003). Former UCLA basketball star Bill Walton(1973) and University of Tennessee quarterback Peyton Manning (1997) have also earned the prestigious honor. Also honored during the ceremony was track and field star Jesse Owens, who received the inaugural AAU Gussie Crawford Lifetime Achievement Award posthumously. Owens’ granddaughter Gina Hemphill-Strachan accepted the award on his behalf. The award was named on behalf of Gussie Crawford, the first female president of the AAU (elected in 1988). She was on hand to present the award.